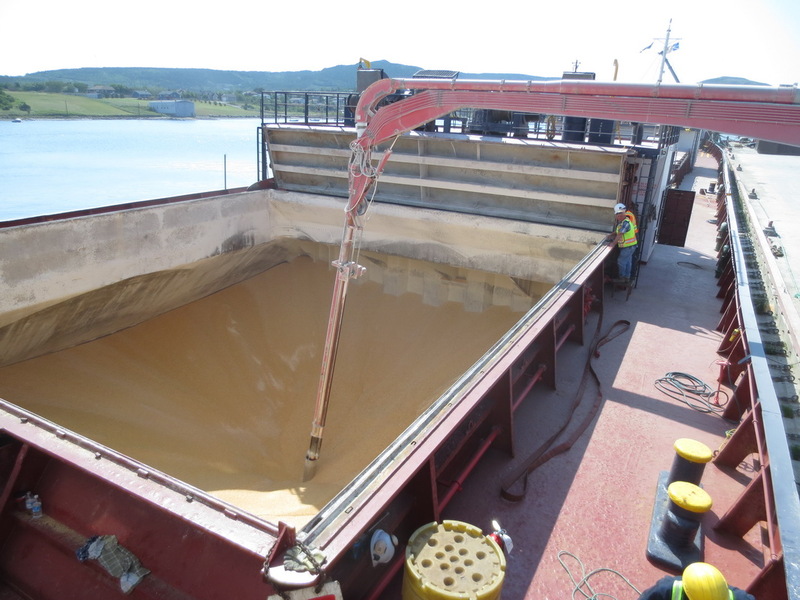 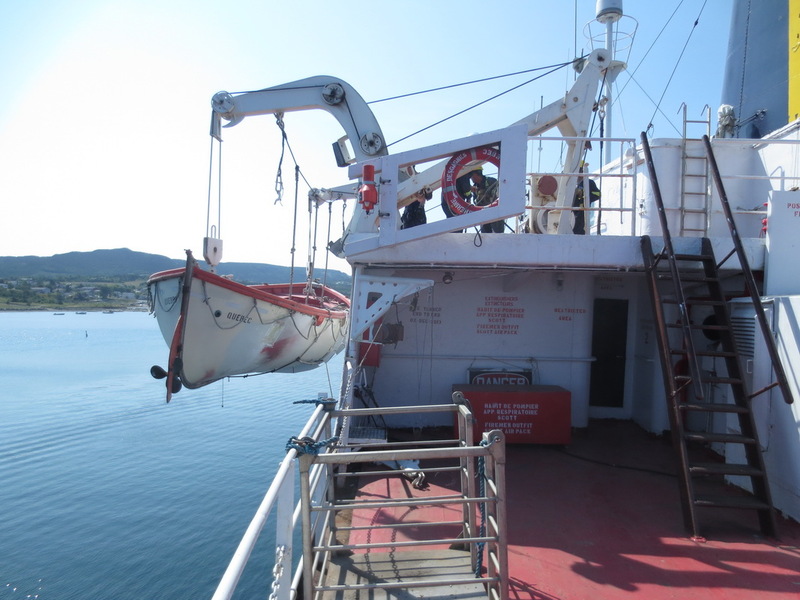 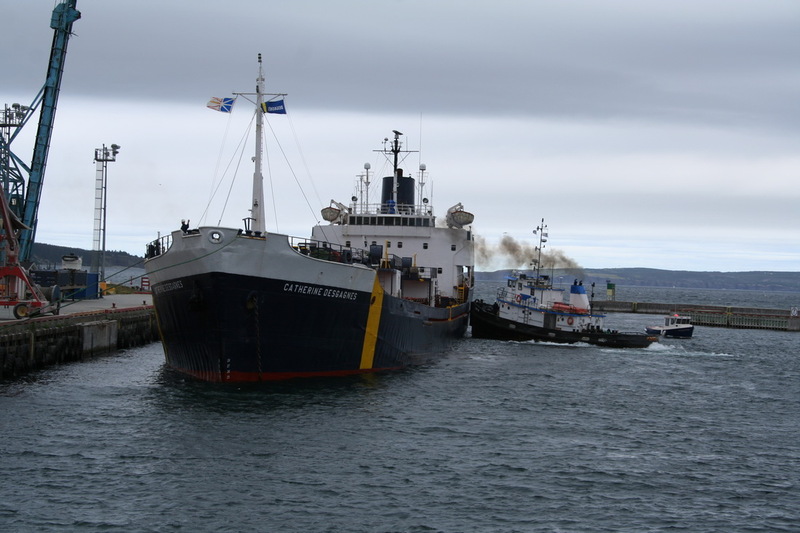 Long Pond, Newfoundland, is not a big port, we had to move the tug and barge I was working on, all the way to the end of the pier, almost aground, to make way for one of its regular visitors, the MV Catherine Desgagnes, and her load of feed corn. 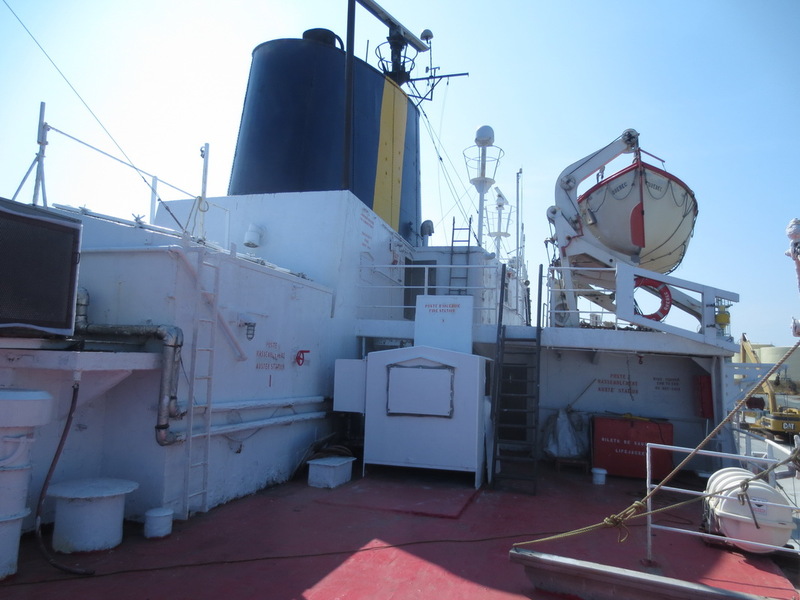 1985 and onwards, the Catherine Desgagnes was operated by Quebec based Transport Desgagnes and is a small, 125 meter long, general dry bulk cargo ship, with a capacity of 8395 DWT. 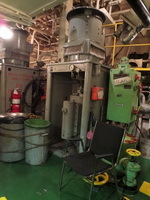 She was built in 1961 by Hall Russel & Co. of Aberdeen Scotland. Originally named the Gosforth, she is powered by a single 6 cylinder Sulzer slow speed, two stroke engine, developing just under 4000 horsepower, giving her a top speed of 14 knots. 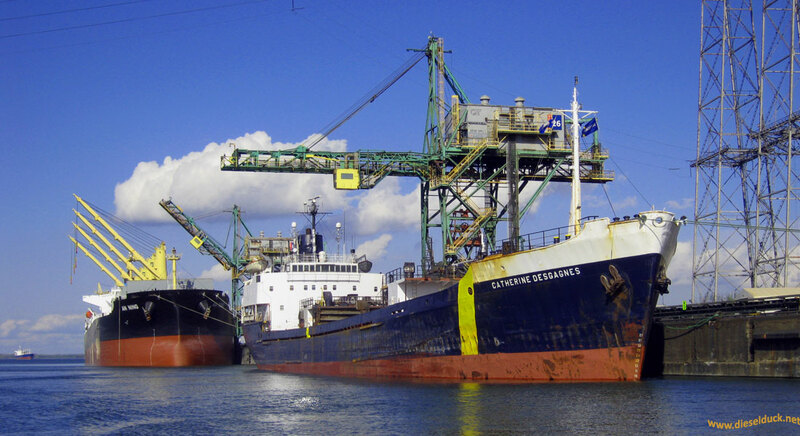 She was classed by Lloyds, and in 2016, is now know as the Catherine III, flying the flag of Sierra Leone. 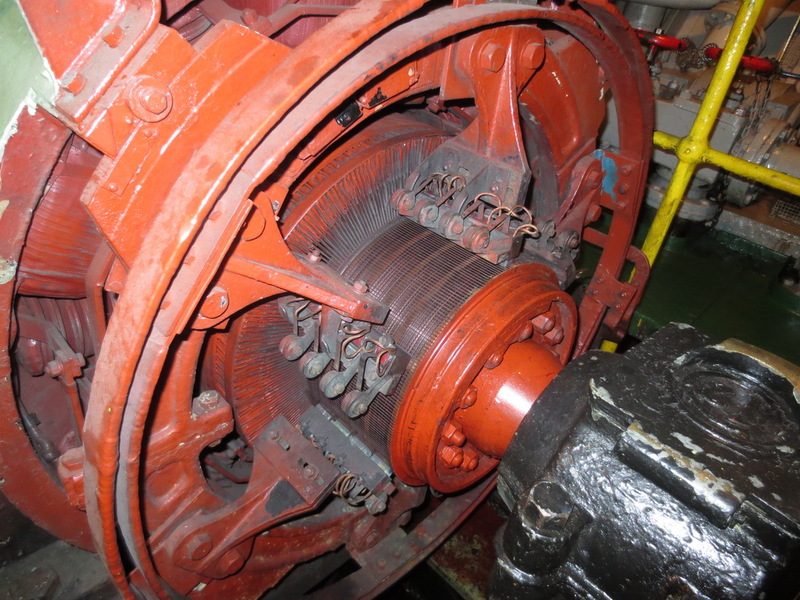 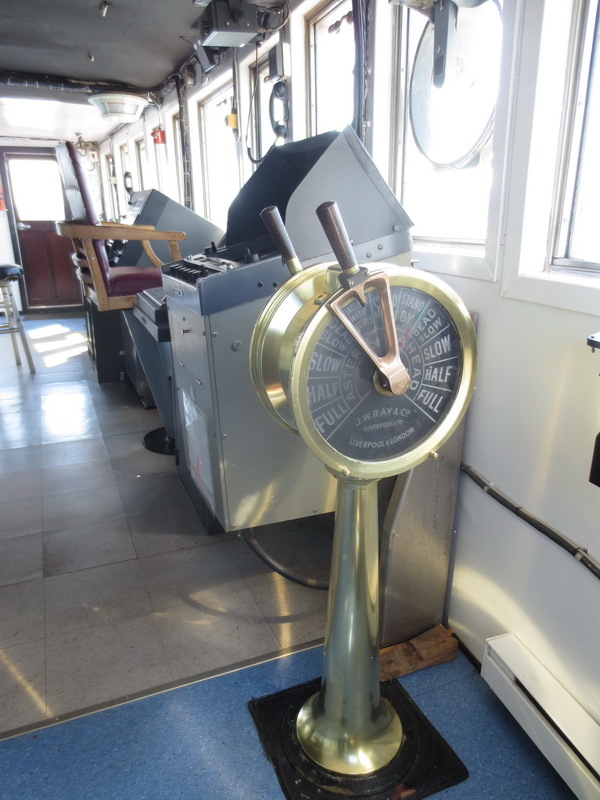 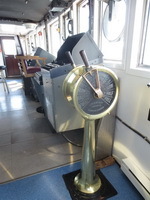 I often get comments about Transport Canada, the regulatory agency that certifies Canadian mariners, and how some of their examination material seems so old and outdated; like who needs to know how or why to under cut commutator bars. Well as it turns out, the Catharine Desgagnes was one such ship, producing and utilizing DC power, that was straight out of an old textbooks, or museum. 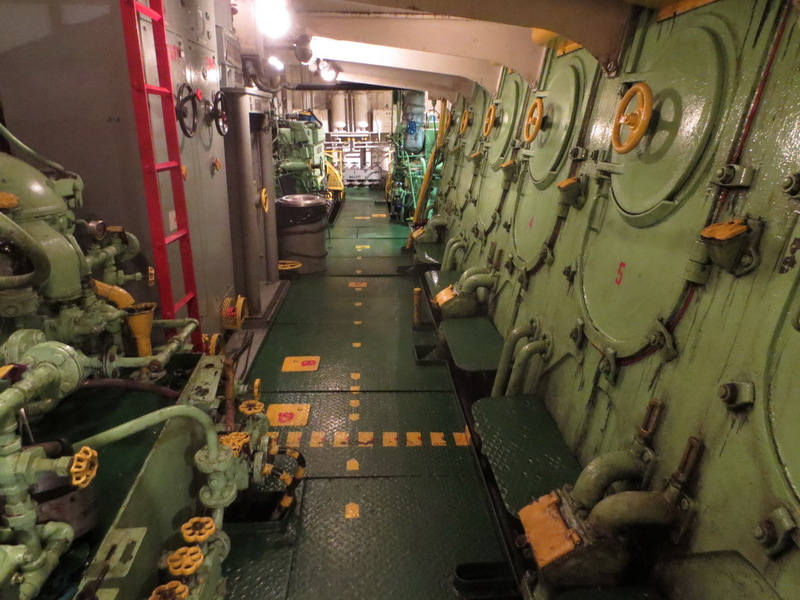 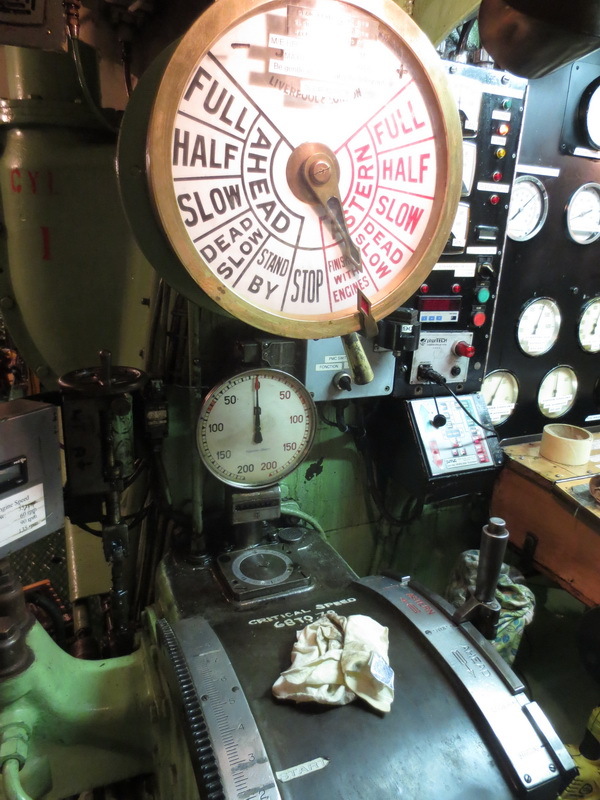 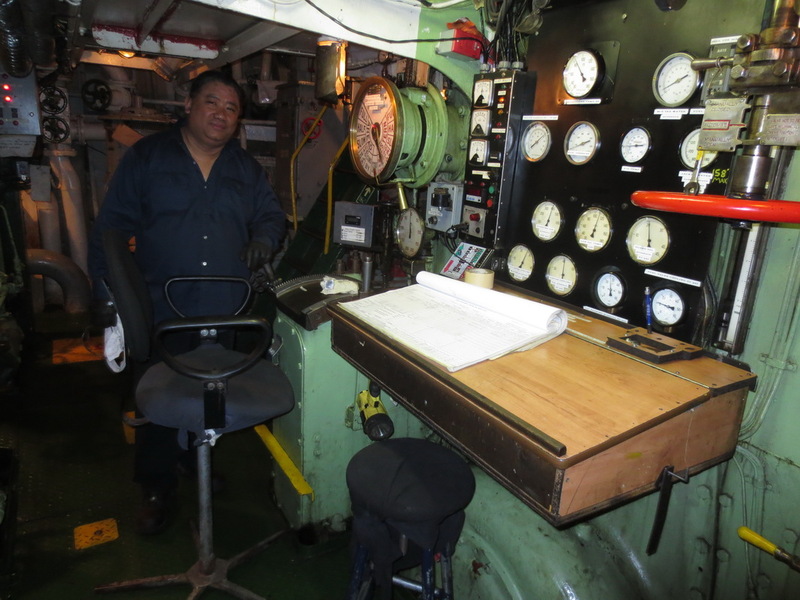 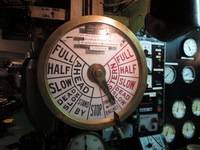 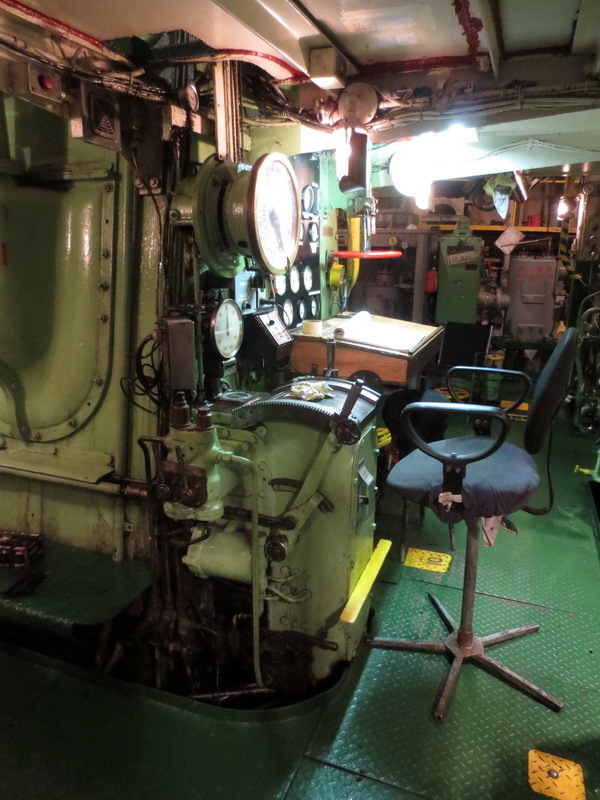 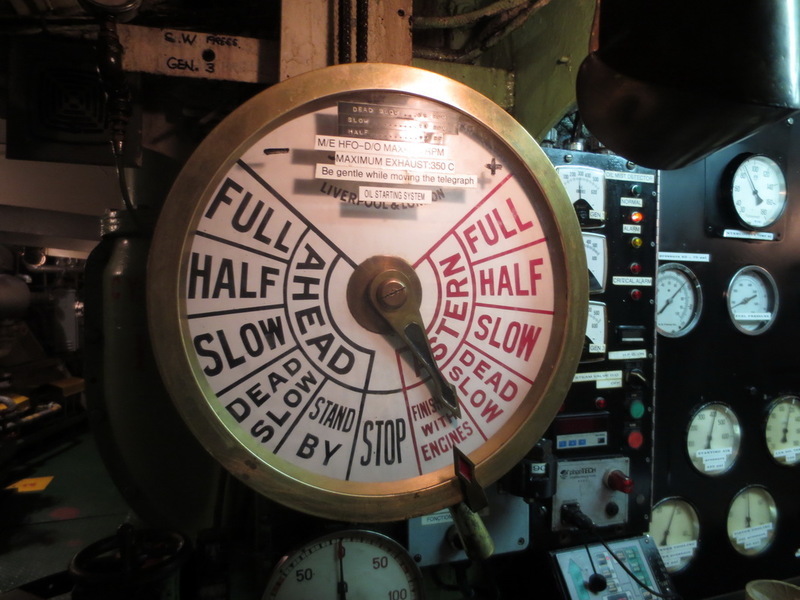 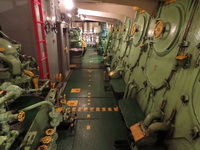 I invited myself onboard and with the Chief's permission had a wander through time, or should I say, the engine room. Catherine Desgagnes has clearly been around a long time, the many coats of paints, old school open lifeboats and launching gear are just some signs of the age. 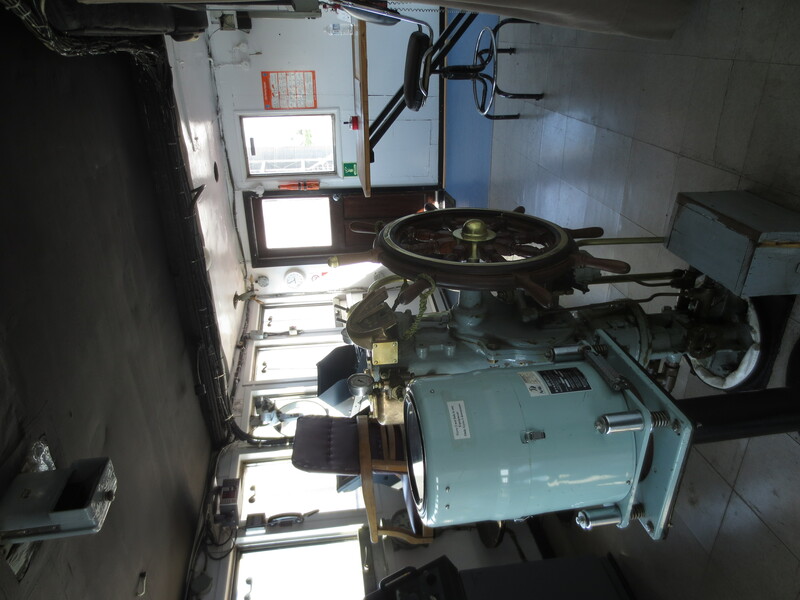 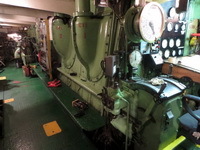 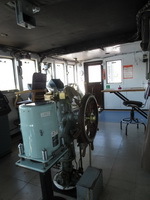 The other, a rare sight nowadays, a traditional engine room telegraph on the Bridge. The receiving telegraph is at the forward end of the engine, a spot constantly manned by the engineer of the watch (EOW). 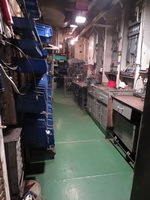 An obviously well used area, customized over the years with notices and adaptations. 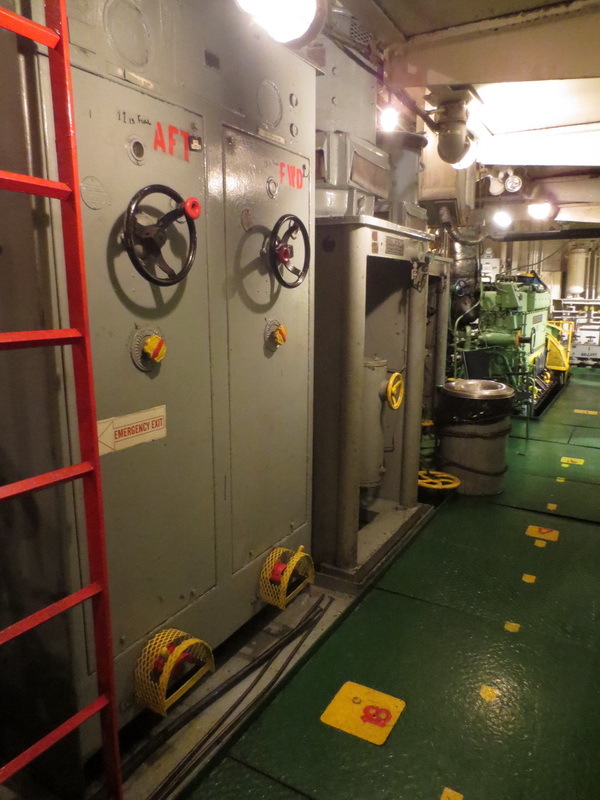 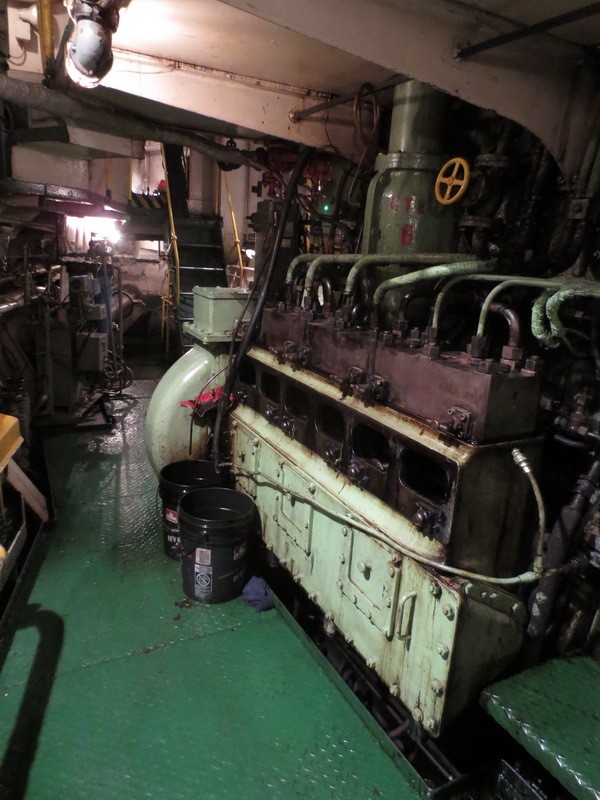 From the engineer's station, we walk around the starboard side of the engine room, past the HP fuel pumps, spares tail shaft. 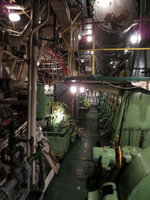 Around the port side, with the lube oil pumps, up to the middle deck, with stuffing boxes. 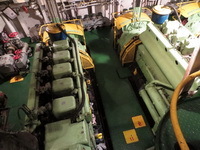 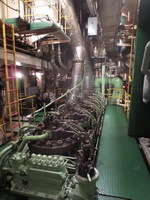 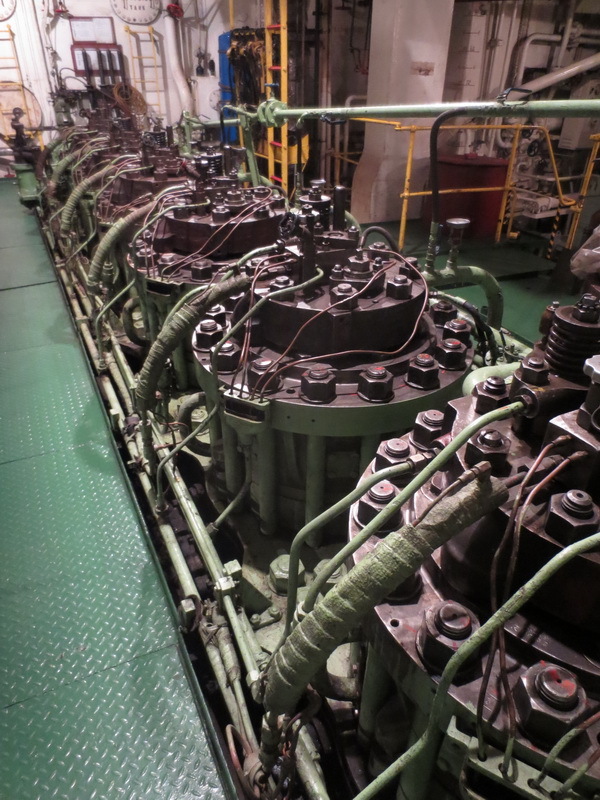 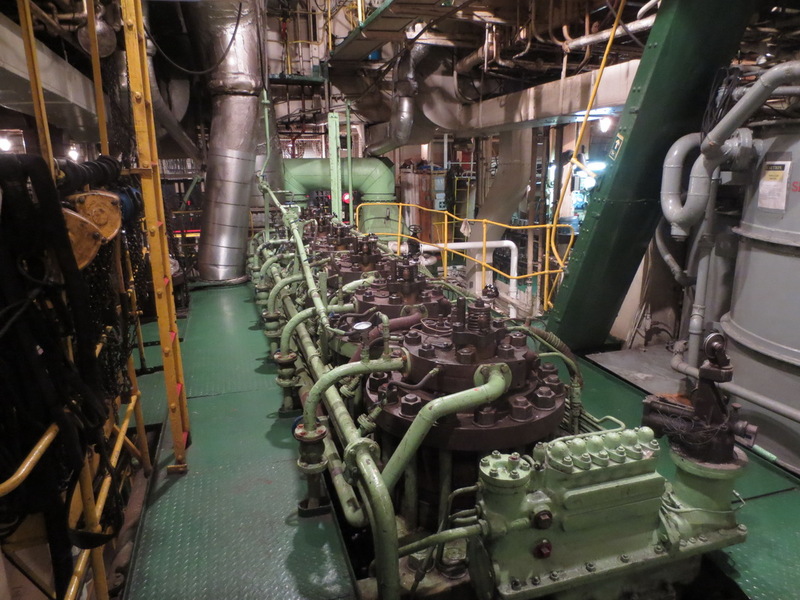 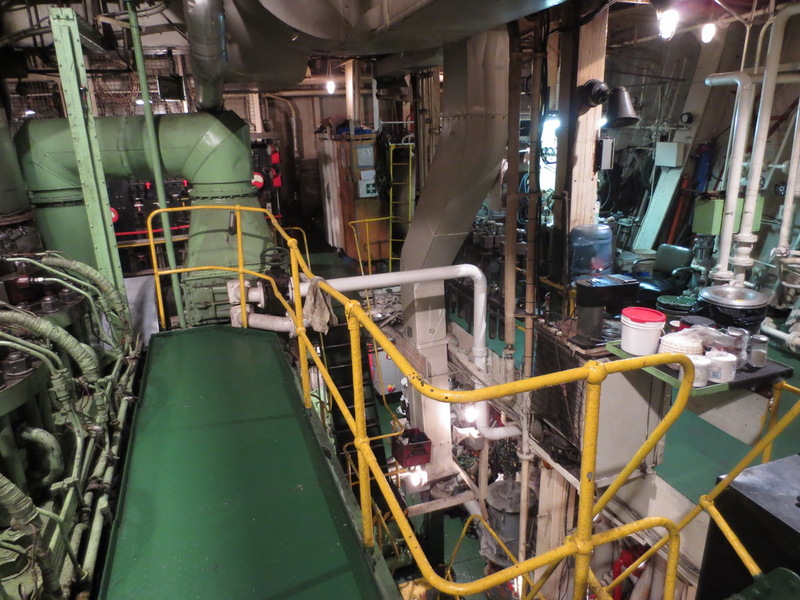 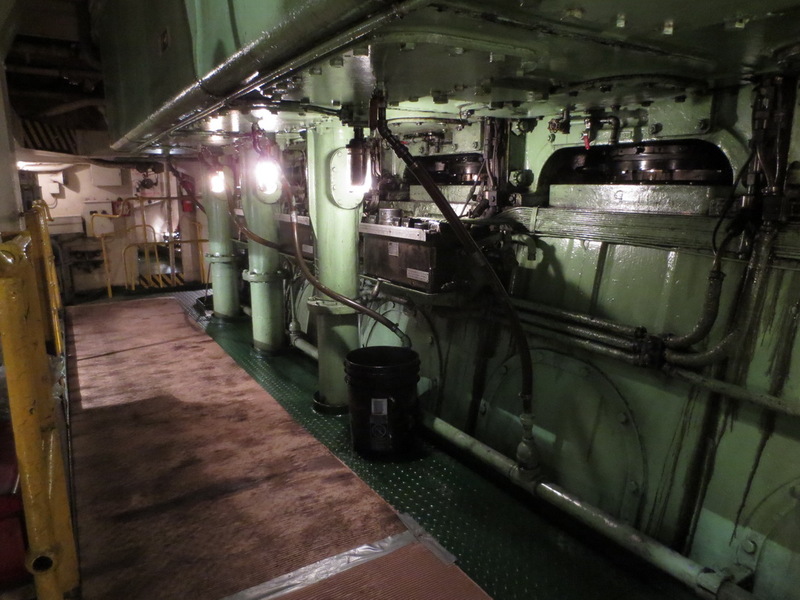 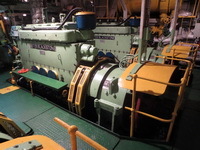 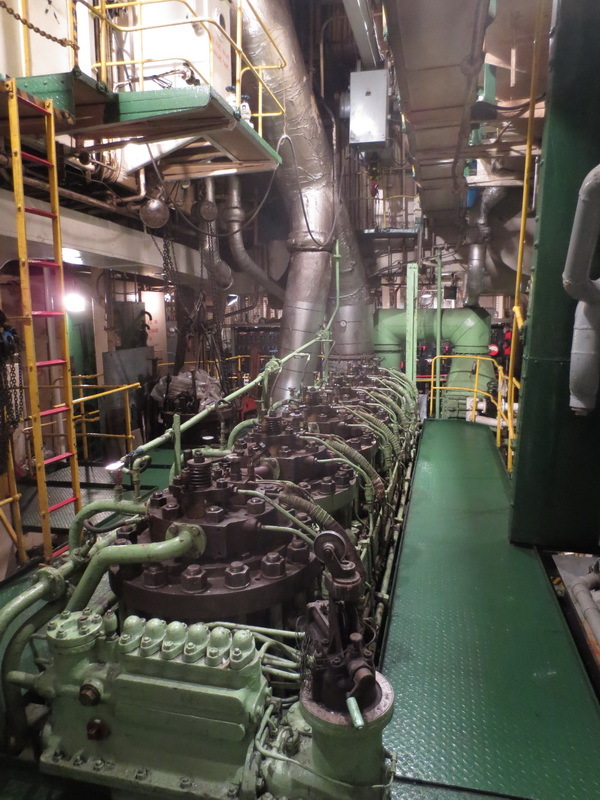 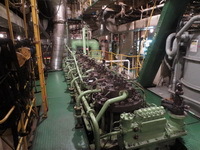 Then on the main deck, we see the top of the main engine, a six cylinder Sulzer slow speed two stroke engine, producing 3840 horsepower. Walking around the top deck, forward we see the jewel of this particular operation, the fantastic DC distribution switchboard; its knife switches are a rare sight these days. 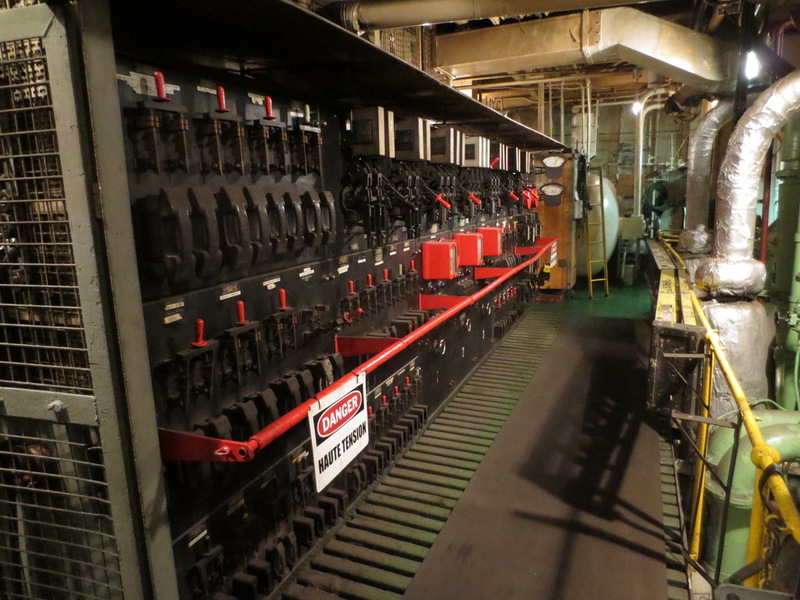 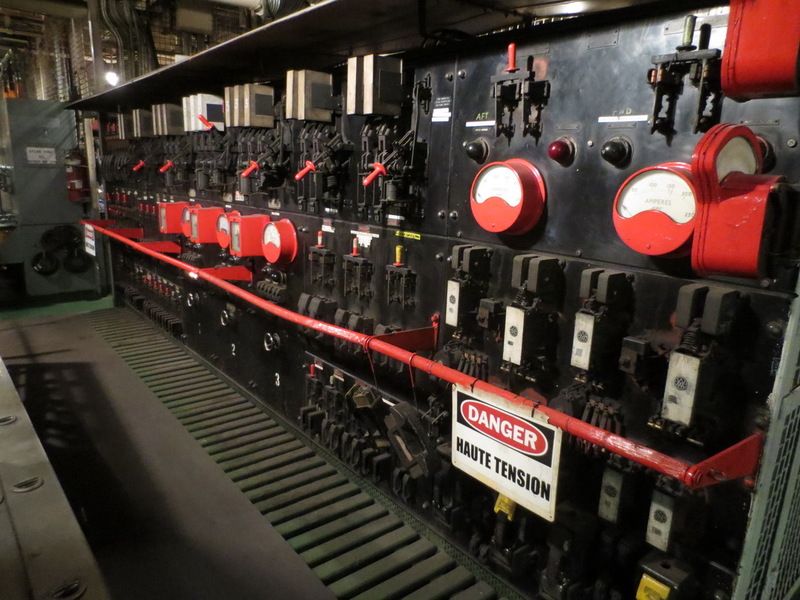 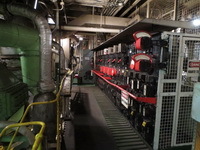 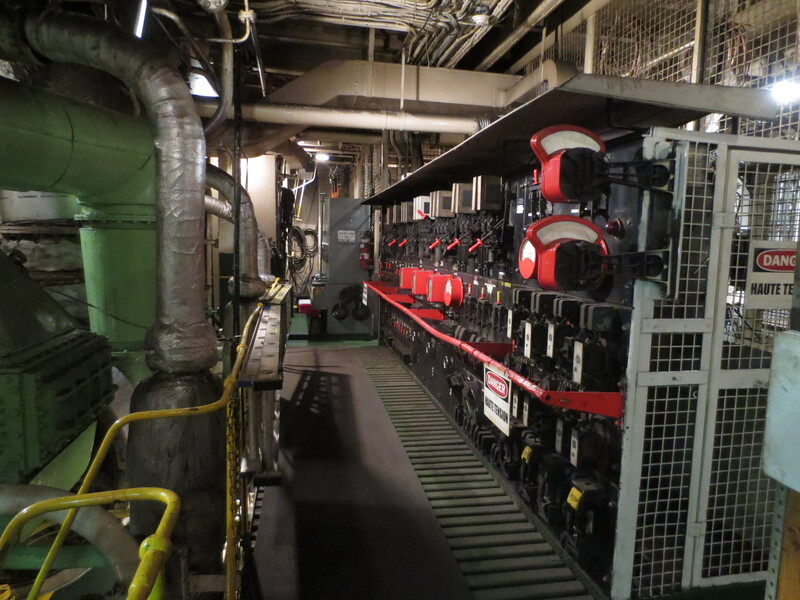 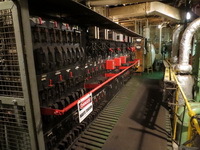 Behind the switch board is the workshop, and below, are the three Lister Blackstone DC generators. 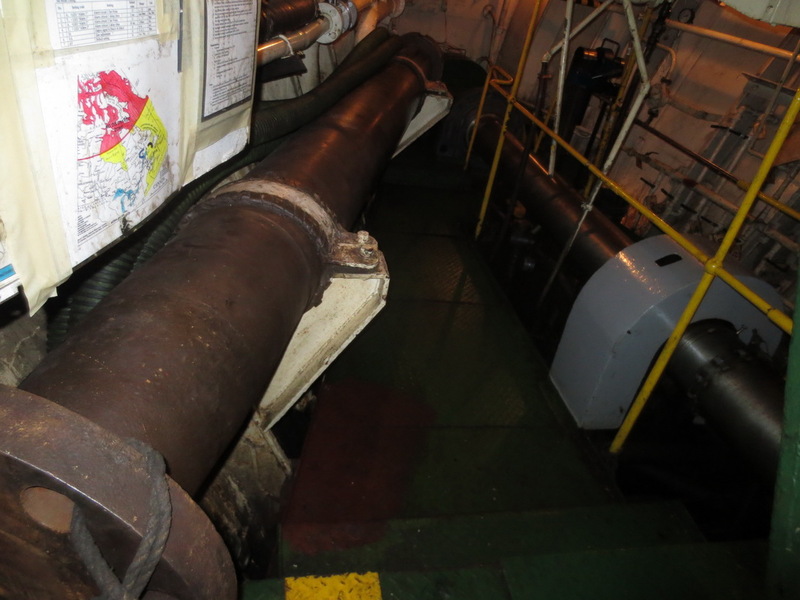 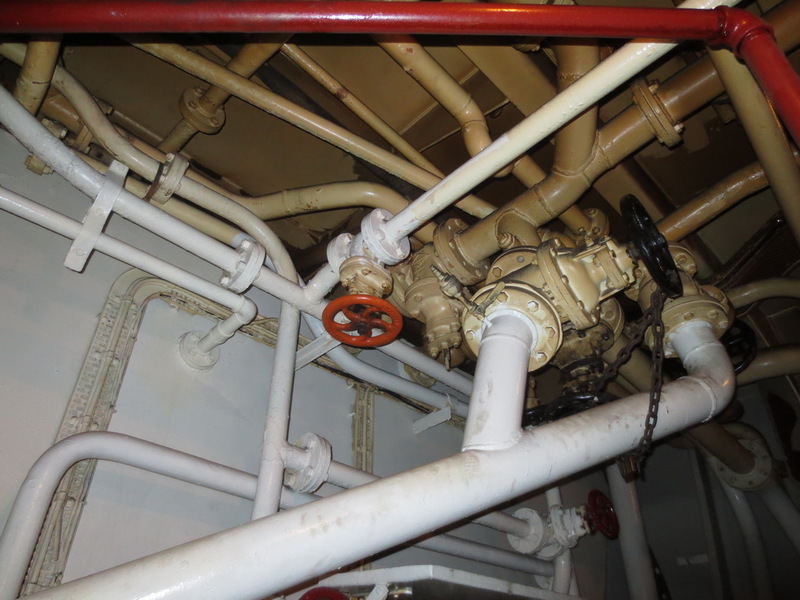 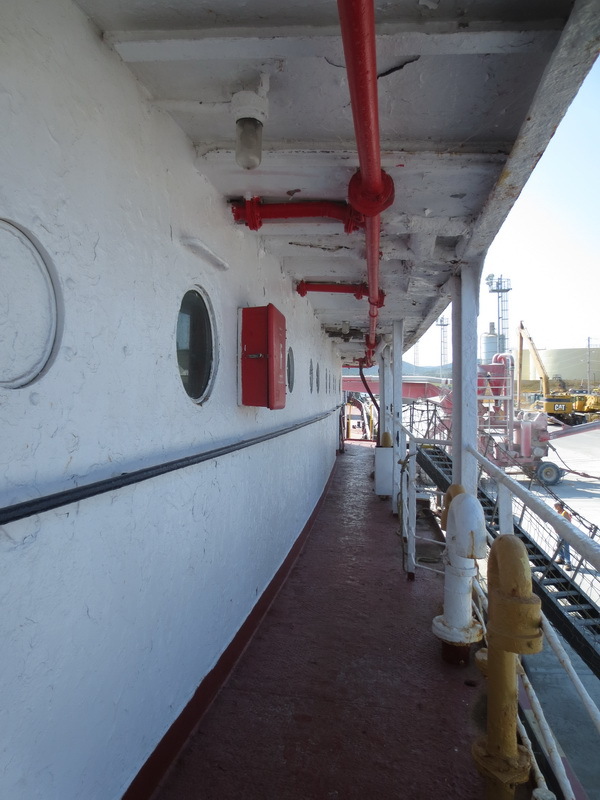 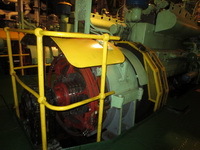 I like to use lots of water when I soogeying the engine room, I think on this ship, it would be ill advised. 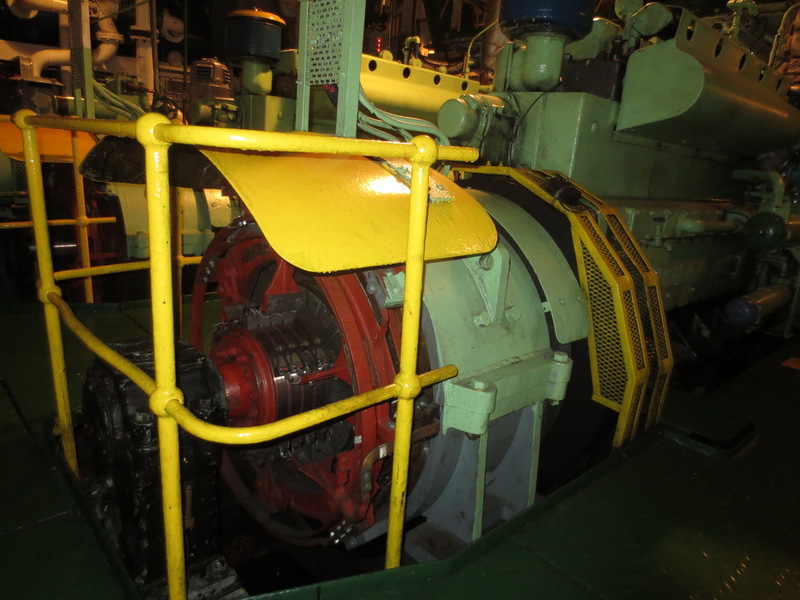 The open running gear, the commutators bars are all exposed. 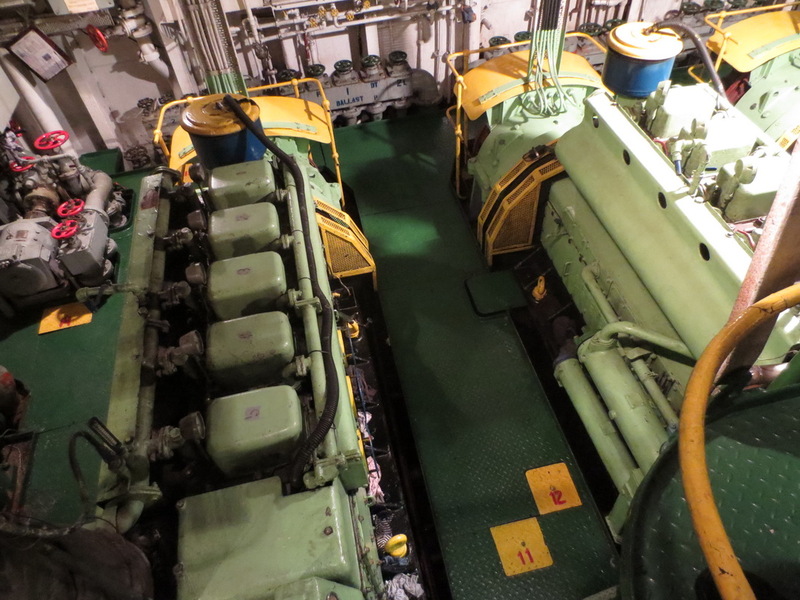 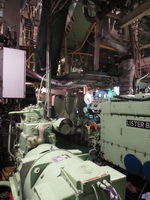 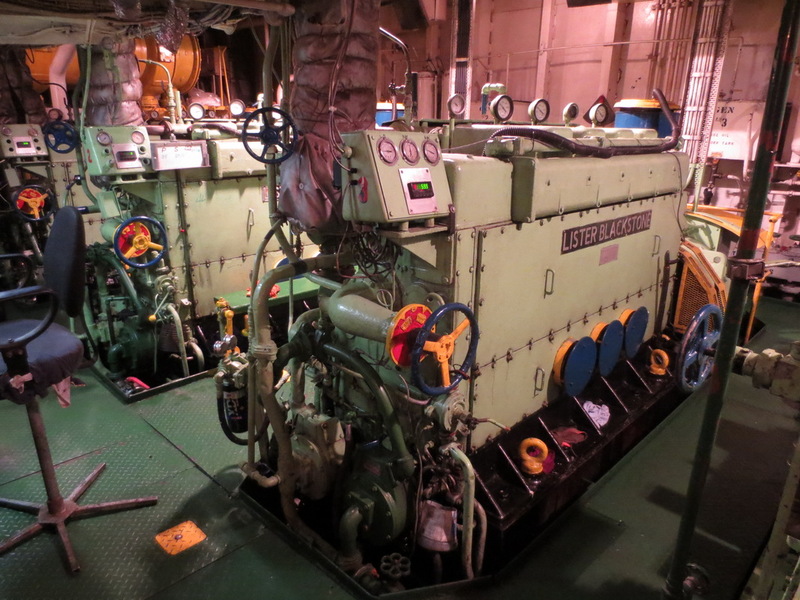 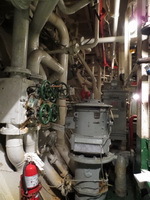 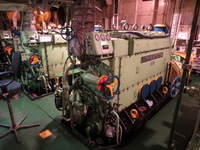 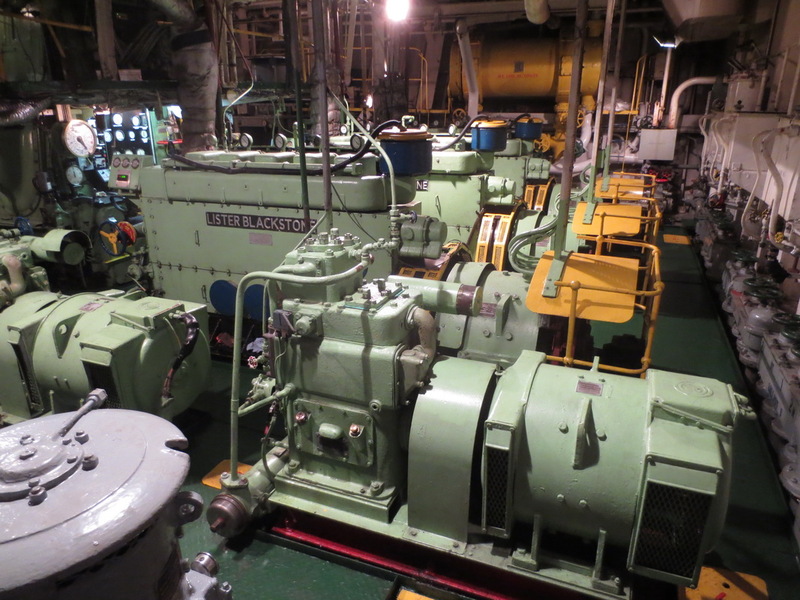 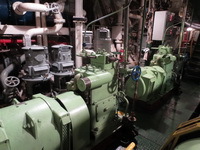 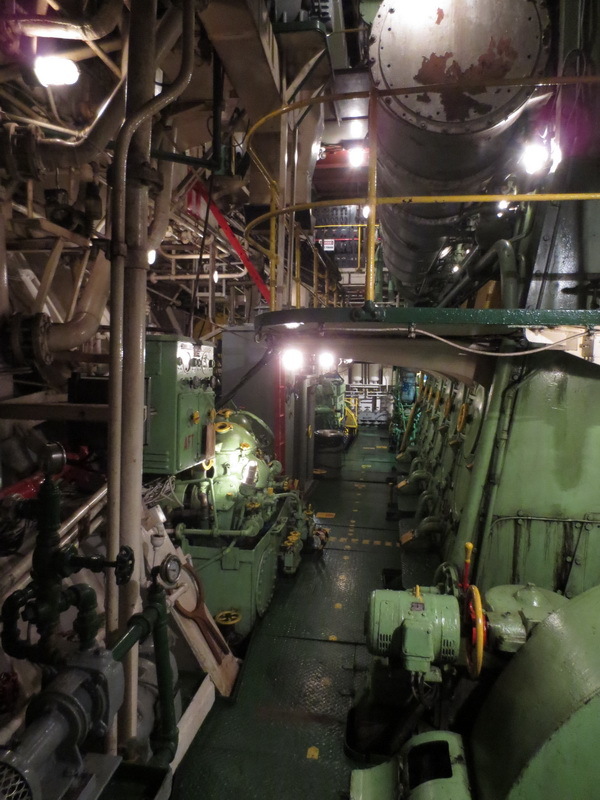 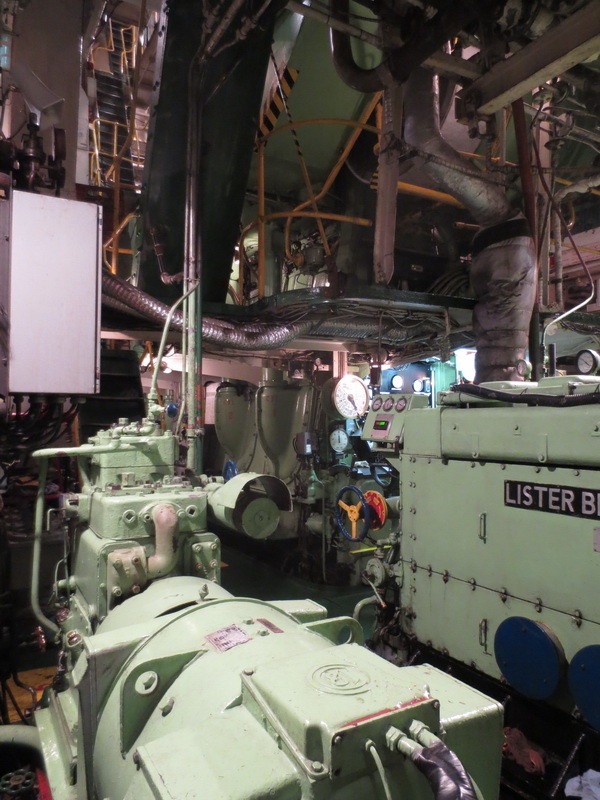 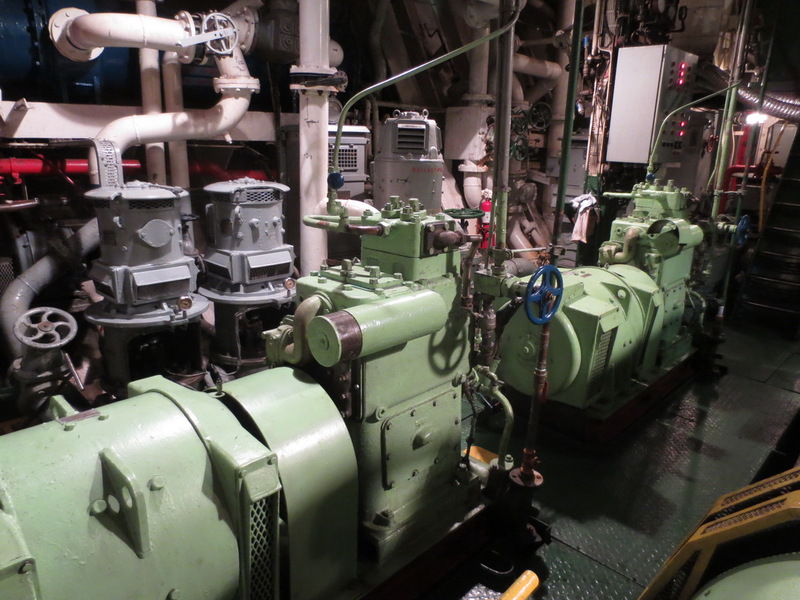 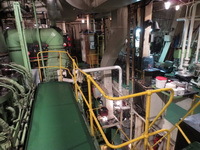 On the starboard forward side of the engine room, are the two massive air compressors. 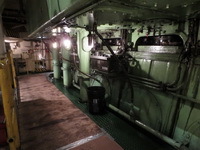 Around the port side of the engine are the massive motors and starter panels for the lube oil and fresh water pumps. 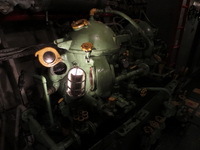 There is an old lube oil separator, but is hard to see due to the dimly lit engine room, the sporadic single light bulb fixtures, which really don't throw a whole light around - probably a good thing really. They "just don't build them like this anymore" is surely a worthy statement, have a look at the complex pipework. 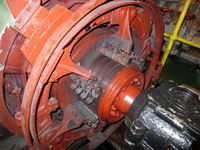 Welded spaghetti look! 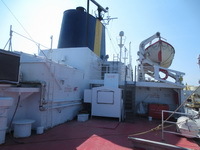 Down below, is another shot of the Catherine Desgagnes, this one, taken in Sorel at the steel mill dock, in late 2011.